It is hard to believe the holidays are fast approaching. For many of us busy moms, this makes our lives even more hectic. As if our plates were not already full with taking care of kids and a husband, running a house and working. For the last few months of each year, we are planning meals, baking for school activities and entertaining. When it comes to cooking those holiday meals, we are usually the ones to do that as well. Thank goodness we have Brylane Home to save us time and money. With their extensive collection of products for the home, indoors and out, they are sure to have something to make your life easier. It may sound unusual, but cooking with deep fryers during the holidays is not a bad idea! 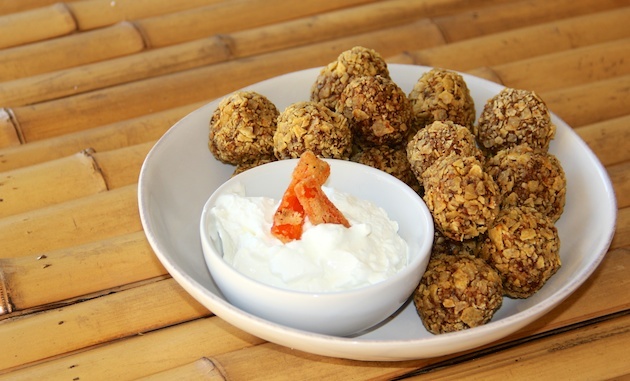 Wait till you taste these deep fried chili balls! If you need drapes for the bedroom, a new carpet for the family room or a chair for the deck, Brylane Home has one of the widest selections around. Their website offers products of the finest quality, are affordable and are backed by a stellar customer service team. One of their hottest selling areas are the small appliances in their home section. They have tons of awesome products, including their Deep Fryer With Triple Baskets which sells for $99.99. Folks have been cooking with deep fryers to make things easier for a long time. 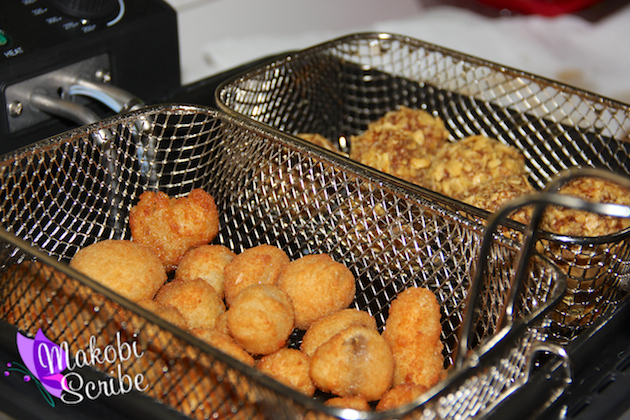 The deep fryer is actually a very versatile small appliance that can cook up a treat, snack, appetizer or an entree. I was sent the deep fryer with my husband in mind, as I knew he would love me forever if I got one. What I found surprising was how many things you could actually cook in it. Instead of baking cookies for the teachers, why not some tasty doughnuts? Instead of baking a turkey in the oven for Thanksgiving, you can deep fry a turkey breast which would be delicious and incredibly moist! With the 3 baskets, you have enough space for foods to cook evenly and because it does not trap grease, the food is healthier. It holds over 16 cups, has an immersion element for fast pre-heating, splatter protection lid and grease filter, which can be washed and reused. The stainless steel looks smart and is easy to wipe clean. 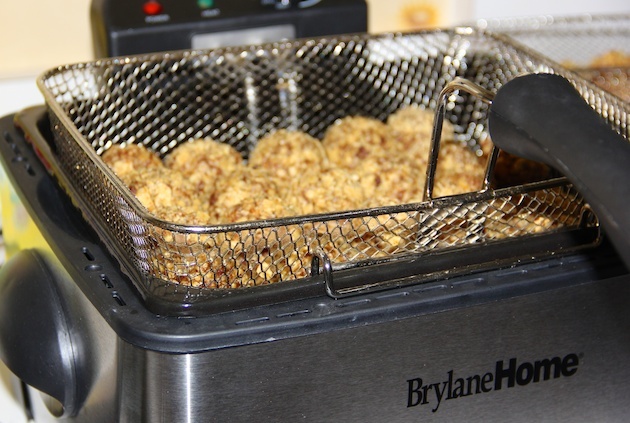 This deep fryer would be a great addition to any kitchen! Be sure to like Brylane Home on Facebook and follow them on Twitter to stay up to date with all of their latest information and deals. So these fried chili balls are addicting, and you have been warned! 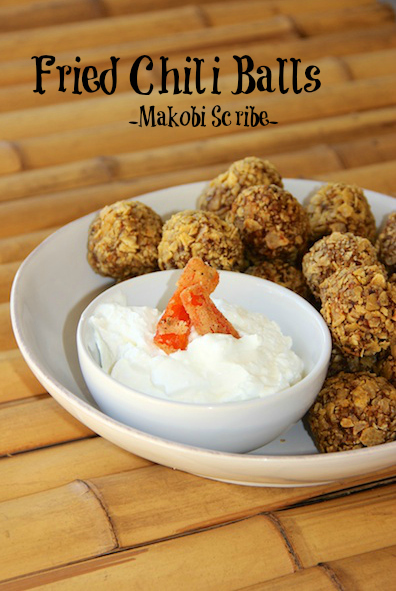 I garnished them with deep fried red peppers in a dill coating and sour cream. Watch out! You will keep returning for more. Previous articleVideo: Everything Out There Starts Here!